For all yall chicken heads out there looking for some work, Doug E Fresh’s Chicken N Waffles is hiring now! Located at 2245 Adam Clayton Powell Blvd New York, NY 10027 (google map) Please send all resumes to job-6w6yj-2439936965@craigslist.org. Please have references handy as well. 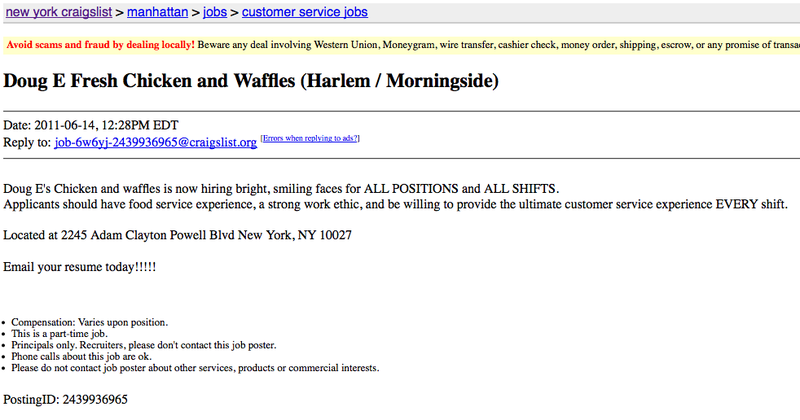 Refer this listing to anyone you know that is looking for a job in NYC. NO CLOWNS, CHICKEN HEADS ONLY.